Special Offer! Click here to see. The Freestyle watch company offers high performance sports watches designed to keep up with and enhance the variety of adventures undertaken by all. Founded in 1981, Freestyle watches embrace the entirety of its own definition. With freedom of movement and creative expression, performance timing, unparalleled water resistance and a limited lifetime warranty; Freestyle watches is always on your side. With specific lines dedicated to the deep sea divers, sport enthusiasts, outdoor adventurers, endurance activities, as well as all things water recreation - Freestyle gives you the freedom to keep track of everything from the tides to the time. Speaking of the tide, Freestyle offers a specialized collection of Tide watches to aid you on your would be surfing endeavors. 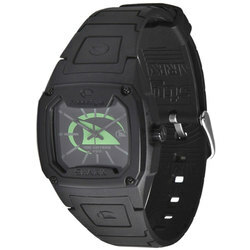 The Freestyle Killer Shark Tide watch specifically, is an expanded take on one of Freestyle's best selling lines. Constructed with a snug silicone band and set in a 48mm case, the Killer Shark Tide watch boasts a wealth of sunset, sunrise and tide data for over 150 beaches across the world. 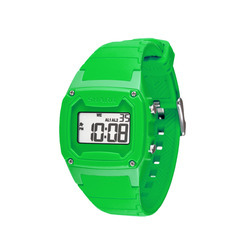 More still, with 100 meter water resistance added to the package — getting side-tracked with deep sea dives is no problem given the Freestyle Killer Shark's night vision light up. Similarly, the Freestyle Killer Shark Skeleton from the Shark line boasts a prideful design that shoes off all its inner working. Fit with a 38mm case and performance fit silicon band, the Freestyle Killer Shark Skeleton watch incorporates an alarm, dual time, countdown timer, stopwatch, and hydro pushers into its design with the added 100m water resistance for all those wet-prone adventures. More still, Freestyle offers an increasing variety of watches geared toward the more disciplined conditioning and exercise lifestyle. The Freestyle Workout 75 Lap watch gives you the added advantage of wearing your exercise partner on your wrist given the 75 lap memory recall and 5 interval timer features. Made with a sturdy polyurethane band and set in a 47mm case, the Freestyle Workout 75 Lap watch will help you push the limits at dusk or dawn with night vision capabilities. Plus, with 50m water resistance, you can take those limits into pool, out on a rafting adventure, or down the street for a jog in style. If you're looking for a little more direction with where you are heading, look no further than the Freestyle Touch Compass watch. Constructed with a brand new Touch Compass feature that allows for touch screen activation, the Freestyle Touch Compass watch gives you the ease of use needed to get through those cumbersome ventures. More so, the Freestyle Touch Compass watch is constructed with a 49mm casing and reliably comfortable silicone strap with incorporated features like 100m water resistance, the digital compass, date, alarm and multi-directional rotating top ring and 24-city world time component. So, whether you find yourself ascending the alps, traversing the African Savannah, or the concrete metropolises throughout the world - Freestyle watches are sure to be a worthy and reliable companion upon all of your endeavors.